This is a full review of the Heat 3 Smart Gloves, rated by extreme weather photographers as the best gloves in even the coldest of conditions. This is the third generation of gloves (hence the name “Heat 3”) from this groundbreaking company who are world leaders in extreme weather gear. Note: Shipping costs may apply. A Word of Caution: The Heat 3 Smart Gloves designed specifically for photography are different to the ones designed for Special Forces. The photography specific gloves have the liner sewn in. The finger sections are connected with thin strips of material, as shown in the image above, for extracting your hand without turning the liner inside out. Pros: Comfortable, warm and toasty without restricting use of fingers (touch screen compatible). Cons: The magnets to hold the open flap back could be a bit stronger, although its hardly worth mentioning. Manufacturer: The Heat Company – based in Salzburg, Austria – they know what cold is! Comfort – 9/10. Really comfortable and practical for photography. If you’ve ever tried using gloves while driving a camera of any description you will know how cumbersome gloves can be. The Heat 3 Smart Glove overcomes all those problems. Warm/toasty – 10/10. They do the job exceptionally well in even the coldest conditions with two to three layers of protection and the option to insert hand warmers. Build Quality – 9.5/10. Intense field testing ensures a high quality glove that is both robust and comfortable. The Heat Company’s world famous ambassadors test their equipment in the toughest of conditions and their feedback play a large part in the development and improvement of the next generation of gloves. These gloves are the photographer’s answer to the age old problem of keeping your hands warm and dry while still allowing you to control those notoriously small buttons on a camera. Keeping the body warm is a relatively easy task but if you have frozen feet and hands you are rendered almost incapable – well I am. Designing a glove to keep your digits warm while still having them operable is quite a feat. Here’s what I found out about the Heat 3 Smart Gloves from people who have used them in the most trying of conditions. 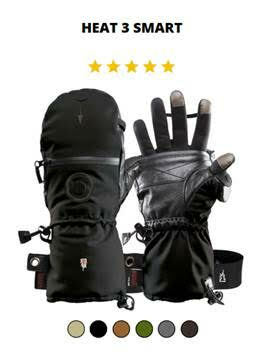 Option 1 is a glove that was originally designed for Special Forces operating in extreme cold weather conditions. The Special Forces gloves consist of seperate units for each layer. The inner liner is the sock that fits on your hand. There are 4 different liners available. A free standing polar hood that is an optional extra, designed to fit over the glove for use in ridiculously cold conditions. Option 2 is a photographic specific glove that is a bit different to the original gloves. The Photographic Specific glove is only one unit. The free-standing polar hood can also be purchased for those insane enough to go out in equally insane weather. NOTE: You will not be able to operate the camera with the polar hood on. The individual liners that you can purchase for the Special Forces are ideal photography gloves too. Sometimes it can be cold but not cold enough to warrant a mitten as well. Here in New Zealand I can definitely see me using a liner only for many of my colder shoots. My first priority was always going to be to determine if the gloves would be warm enough to keep my hands warm and dry. If your hands get cold as easily as mine do, you’ll find these gloves to be the perfect solution for those long suffering digits. There’s only one thing I hate (fear) more than cold hands and fingers and that is wet hands and fingers! Any gloves I wear must have the ability to keep my hands both dry and warm. Layer 1 – Liner (Inner Glove). This is the layer that your hand slides into. Think of this as a sock fitting over your bare foot before putting your shoes on – except in this case the sock is sewn into the shoe so they go on together. Layer 2 – Shell (Mitten). The mitten really comes into its own as a photographer’s glove with the ability to expose the fingers by unzipping a flap on the outer mitten that folds back allowing your fingers to operate the camera buttons or touchscreen all while still nice and warm in the liner. The mittens have small pockets on the back of the hand to accommodate hand warmers and provide additional warmth if needed. The guys at The Heat Company really have thought of everything. Layer 3 – The Polar Hood. An optional extra, this additional, lightweight layer fits over the shell providing yet more protection against strong winds, rain and ice. The palm of the polar hood has a silicone print for better grip in icy conditions making carrying any equipment so much easier. Layer 4 – The Extended Cuff. Okay this is not a seperate layer, I just made that up, because I think it needs mentioning. The cuff on the glove is extended some way beyond the wrist to prevent cold and moisture seeping in via the wrist. I had a pair of gloves once that on first use had rain pour in through the wrist area. The only way to overcome the problem was to hold my hands in the air but by then the damage was done and my fingers were freezing. The Heat 3 Smart Gloves use goat skin in the palm section of the glove – goats skin is amazing in that it is a robust yet incredibly soft leather, this combination gives you maximum flexibility and strength where it is most needed. The true test of any photographic equipment should be done in the field and gloves are no exception. The Heat Company (should be called the Smart Company) use world famous photographers who make their living from photographing in extreme conditions as what they term “Ambassadors”. These ambassadors field test the gloves and give valuable feedback to the company that helps with any further improvement in design. You can read more about the ambassadors (and see some of their amazing photos) by clicking here. So how do these gloves work for mere mortals like you and I? When not actually operating the dials on the camera your hands are warmly encased in the liner and the mitten. When you need to operate the camera buttons or touchscreen you simply peel back the top half of the mitten to free your still warmly covered fingers to operate your camera. Once done simply slip the fingers and thumb back into the mitten and zip it up. Magnets retain the flap (keeping it out of the way) while you are operating the camera. The last thing you want while looking through the viewfinder or operating your touchscreen is a pesky piece of material flapping around in your face! Note: There has been the odd report of the magnets being a bit weak and I guess time could also have a bearing on their longevity. Personally if the gloves keep my fingers warm and last even a couple of seasons I’ll be happy. The Heat 3 gloves have an optional polar sleeve that fits over the mitten. Available directly from The Heat Company for just under US$70.00. Made from 100% nylon the polar sleeve fits over the mitten/glove and is for use in extreme weather conditions. The palms of the polar sleeve have a silicone print to provide grip in the icy wet conditions they will be used in. The Heat Company really have thought of everything. The mittens have external pockets to accommodate heat warmers on the backhand of the mitten. Nice to know that the insertion of a small hand warmer that lasts up to 12 hours is available if needed. The Heat 3 Smart gloves come with snug fitting extended cuffs to cover more than just the wrist. I’ve used gloves in the past that have allowed moisture and cold to seep in from the wrist and, once in, that cold is staying there – no such problem with these gloves. Built in magnets keep the fold-back sections from flapping around and getting in the way of you operating your camera. I have small hands for a man so it was nice to be able to measure my hand based on the The Heat Company’s guide to ensure I had a snug fit. You don’t want a loose fitting inner liner that will make it difficult to operate your camera. So here’s how you go about measuring. The tape should be loose and not too firm. There really is nothing to dislike about these gloves. They are perfect for any type of weather I am ever likely to encounter and even if I do arctic or other extreme weather photography all reports are that these are the gloves to go to. For $165.00 I have all the gloves I will ever need. A word of caution about where to buy and what to be wary of. I came across a couple of outlets (one being a vendor on the biggest retail platform in the world) who seemed to be inadvertently and incorrectly describing the the Heat 3 Smart Gloves. The problem seems to be that they are marketing the company’s other gloves as Heat 3 Smart gloves. The different models are quite different and intended for different uses. Be sure to look at the Heat 3 Smart Gloves with the sewn in liner. I highly recommend you deal directly with the Heat Company and contact them if you are not 100% certain. I also managed to find additional first hand reviews which you will find interesting. 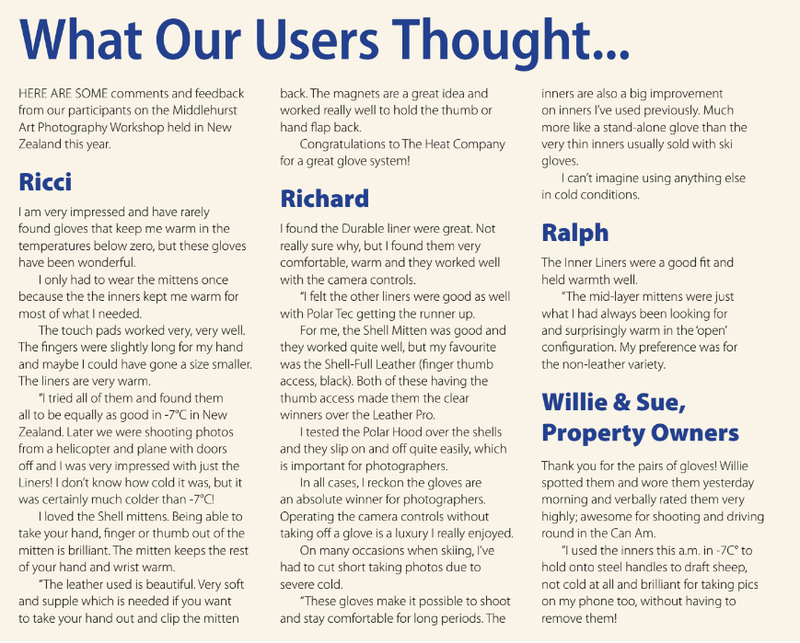 Here’s an extract from “Better Photography” magazine from users who were asked to trial the gloves in pretty cold conditions here in New Zealand. Note that the liners alone were adequate for temperatures around -7 and lower. I discovered the existence of these gloves as a result of Tracey Lund’s guest post in which she gives tips on cold weather photography. Up until her mentioning the Heat 3 Smart Gloves I had never found a pair of gloves to suit my cold-hating digits. I must say as a person who suffers from cold hands and feet (seriously I must be the most miserable person around when either are cold) I am thrilled to have found gloves that will keep me warm and allow me to join my photographer friends on cold weather outings. For more information and reviews on the Heat 3 Smart gloves click here.